This is a short blog post about supporting children with selective mutism. All children are different so these tips may work with some children and not with others. Selective mutism – what is it? It’s an anxiety disorder where children are unable to communicate effectively in certain social settings. Children with selective mutism may communicate really well at home and not speak at all at school. 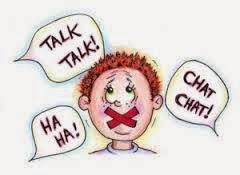 Usually children with selective mutism have a social phobia – fear of embarrassment or being judged negatively. Create a relaxed environment – don’t put pressure on the child to speak – he/she will speak when they feel ready. Write a social story with the child.